This product is absolutely incredible! I am a huge fan of Drive, and have been looking for the shirt that Ryan wears in the film (I even tried cutting my own shirts to match the look). After many times of being unsuccessful in finding the shirt, I found this product by Magnoli Clothiers. I tried the shirt on for the first time and HOLY it looks exactly the same as the one Ryan Gosling wears in the film. I can understand why some are saying to size up, and while I was debating doing so when I ordered the shirt, I did not size up. 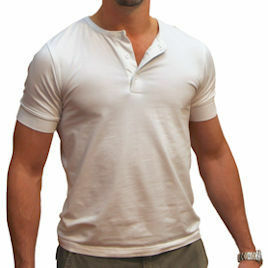 It fits tight around the arms (which is the purpose and the main reason why I like the shirt so much), and enhances your chest features. I am a lean person with a good amount of muscle and low body fat just like Ryan in the movie, so if you are skinny, lean, or muscular, you should definitely stick to your size as the shirt will be tight fitting around the arms and chest. The material is very comfortable. Overall I can't be happier with this product and will definitely order from Magnoli again.